I started my return journey for Jaipur from Tal Chhapar in western Rajasthan on a winter afternoon. Tal Chhapar is a Black Buck wildlife sanctuary. As per the current estimate, it is home to 4500-5000 blackbucks and its topography is similar to the African Savanah. Tal Chappar has shot into fame lately because it attracts many migratory birds during the winters from Siberia and Mongolia. The road from Tal Chappar to Laxmangarh is being widened and driving an SUV is also a pain. Past Laxmangarh, its fun to drive on a smooth tarmac all the way to Jaipur. But this time, I had planned a detour from NH 52 towards a less popular temple called Harshnath on Harsh Parvat. It is well-known among the locals but is over-shadowed by another temple – Jeen Mata. Harshnath temple is on Harshgiri or Harsh Parvat which is part of Aravali hill range. People claim that Harsh Parvat (mountain) is the second highest point in the state of Rajasthan with an altitude of 1800 meters after Mt. Abu. The claim seems acceptable as Mt. Abu is at an altitude of 2000 meters. Driving through the country roads in Rajasthan. After taking a detour from Bikaner- Jaipur highway and driving through the country roads via small villages, the ascend for Harsh Parvat is abrupt and the road is desolate. In the hope not to miss the sunset, I had an urge to speed up but it seemed impossible because once you drive past the Forest department check post the road is almost non-existent. Driving at 10 km/h, it took near about 40 minutes to reach the hilltop. There were hardly any vehicles on this inhospitable way. I can’t recall having seen even 5 cars on the way up! The reason is understandable. With pathetic road conditions, people prefer not to visit. As you ascend the views start getting better with the setting sun. Road to Harshnath. Nothing less than adventure! Windmills and monkeys dominate the landscape on Harsh Parvat. You might be tempted to know what’s so special about this temple. To explain it better, let me brief you with a little history of Harshnath Temple. Harshnath is an ancient temple on Harshgiri dedicated to Lord Shiva and dates to 956 AD. As per Archaeological Survey of India, the temple was built by a Shaivite Bhavarakta known as Allata during the reign of Vigraharaja I of Chahamana dynasty. Most people have not heard about Chahamana dynasty. Many historians consider the origin of Chauhan Rajput rulers to Chahamana. Chahamana dynasty ruled over a vast area of Rajasthan and Haryana from 7th to 12th century. Their earlier capital was in Sambhar famous for the salt & delicious Indian sweet -Fini. They worshipped Shakhambari Mata and this temple still exists in Sambhar. Ajmer became their next capital under the rule of Ajayraja. That’s how the name Ajmer is derived. Chahamana repulsed attacks by the famous Muslim invader Mohammed Ghazni of the middle east. Famous Adhai Din Ka Jhompra which was converted into a mosque under the Mughal rule was built by this dynasty. Chahamanas were famous as Chauhans of Shakhambari and later as Chauhans of Ajmer. I recall having seen pictures of this temple with a tall spire. I assumed this must be the ancient Harshnath temple but I was wrong. It was built in 1718 AD by Chauhan king from the ruins of the original Harshnath temple right next to it. Stones from the original temples have been used in building the latter temple. Stones with defaced idols from old temple have been used in the construction of new Harshnath Temple. It was plundered by the muslim army under the rule of Aurangzeb in 17th century. Ruined Harshnath Temple as seen from West direction. The original 10th century temple is made of stones. The temple has beautiful and intrinsic carvings on the pillars and ceiling. This temple is contemporary to the famous Khajuraho temples. They were built during the same time period and one can see many similarities in their architecture & structure. Harshnath Temple was as beautiful as the temples of Khajuraho. The detailing in these idols prove it. The rich carved stones from the temple ruin can be seen all around the complex. You can’t miss this beautiful idol of Nandi made of white Makrana marble. I’m not sure if this was installed when the new temple was built in the 18th century or if it’s from the 10th century. As a custom, the idol of Nandi is commonly installed in Shiva temples because it is considered as the trusted steed of Shiva. As per Hinduism, every Hindu god has a Vahana or vehicle. Nandi is considered as gate guardian of Shiva. It stands for truth as well as righteousness. Nandi in white makrana marble. Here are few pictures from the sanctum of the ruined temple. The stones have elaborate and detailed carvings. These two temples are not the only temples on the Harsh Parvat. There’s yet another one situated a little further and doesn’t even resemble a temple structure. This temple must have been built during the 18th century since stones and idols from the ruined temple have been used in the facade. It is Behrun Ji ka Mandir and you need to descend down to a lower level to reach the sanctum. I assume this one is more popular among the locals since there was a flurry of activity and a number of Pandits. While Harshnath temple is under ASI, I assume this one is privately managed. The priest issued an “advanced warning” against photographing the idol and temple. With the setting sun, it became imperative for me to leave ASAP considering the road conditions and the long drive ahead. Have you experienced this phenomenon of a place getting firmly entrenched in your mind? Harshnath is one such place which got firmly entrenched in my mind ever since I heard about it a few years ago. I have wanted to visit this place but as they say that it doesn’t happen until it’s destined to, the opportunity to visit Harsh just didn’t materialize for one reason or another. Harsh Parvat is one of the interesting places to visit near Jaipur. I wish to return here again but on foot! Harsh Parvat makes for a great hiking place near Jaipur. But given the height of this mountain, it’s not going to be an easy one! Is it worth visiting Harshnath Temple? Yes and No. Yes, if you love history and heritage. Harsh Parvat is a kind of place that will make some people happy as it is full of peace and tranquility. You can give this place a miss considering the driving distance and road condition from the base of Harsh Parvat to the temple. Do note that any kind of facilities required by a tourist or traveler is not available here. Good work for braving those difficult roads Arv! Would it be possible to drive up there for the sunrise, rather than the sunset? Then it would be far less scary on your way home!! It is pretty awesome that there is a road (even a bad one) reaching up so high! It is such a shame these historical temples have been destroyed. I wonder if anyone would ever had the funds to restore them? Josypheen, this place makes for a great sunrise point as well. Well, one can also hike up instead of driving. As for restoration, given the kind of heritage sites we have, funds will always be an issue. But some temples have been restored with the help of charitable trusts. Well, that’s more of an exception. Thanks for reading and sharing your thoughts. Maybe one day they’ll be more national-level funding available for restoration. I have been to this place before 2 years. the beautiful place depicting the richness of Indian heritage. These thousands of years old beautiful temples were destroyed (badly destroyed) by Mugal Empires. There is no shortage of funds. But as India is Democratic country none of these Heritage masterpiece were restored. Harsh Parvat is such a serene location with this beautiful ancient temples and its unknown history. The hardship of the long drive through the bad roads must have vanished by the stunning sunset view from this peaceful destination. Arv, thanks to you for showing us these unknown destinations through your wonderful posts. Sarmistha, It is definitely serene. The road was bad but luckily with SUV things are slightly better. I didn’t notice many small cars because locals hire jeeps and bolero to reach up. I assume they know there is no point in exposing their cars to extra wear and tear! I’m sure there are many such unexplored places around us. Have you visited any? I have also been to a few and these unexplored places are definitely heavenly. Happy to know. In Blr or Kol? In Kolkata and in Pune both. Great. Would love to read some of those interesting ones. Kerry, I agree this temple is beautiful and has a lot of carvings and details. At times we need to push ourselves to see the hidden and unexplored. The road was bad but somehow we managed. Thanks for appreciating and sharing your thoughts here. Such an interesting read. Makes me want to travel more. I love your pictures by the way, they really seem to have captured your experience. Rajasthan has been long on my travel list & after reading your post it only pushes me more to visit there. 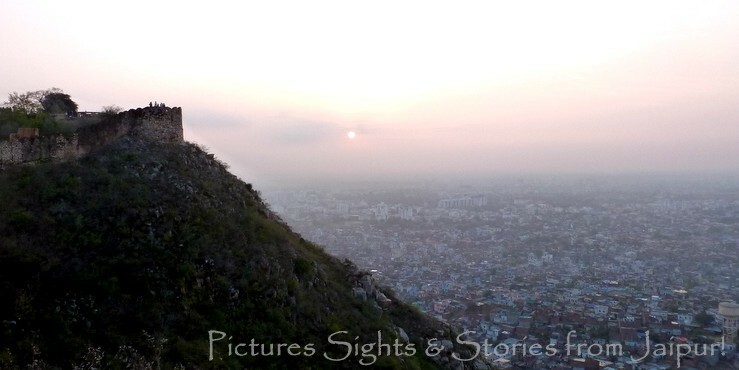 Next Next post: Why Sunrise At Nahargarh Fort Is Not A Good Idea?